Posted by OromianEconomist in Aid to Africa, Corruption, Economics: Development Theory and Policy applications, Ethnic Cleansing, Finfinne is Oromia's land, Finfinnee, Finfinnee is the Capital City of Oromia, Finfinnee n Kan Oromoo ti, Free development vs authoritarian model, Genocidal Master plan of Ethiopia, Human Rights Watch on Human Rights Violations Against Oromo People by TPLF Ethiopia, Janjaweed Style Liyu Police of Ethiopia, Knowledge and the Colonizing Structure., Knowledge and the Colonizing Structure. African Heritage. The Genocide Against Oromo Nation, Land and Water Grabs in Oromia, Land Grabs in Africa, No to the Addis Ababa Master Plan, NO to the Evictions of Oromo Nationals from Finfinnee (Central Oromia), Oromia wide Oromo Universtiy students Protested Addis Ababa Expansion Master Plan, Oromian Voices, Oromians Protests, Oromiyaa, Oromo, Oromo Diaspora, Oromo Identity, Oromo Nation, Oromo Protests, Oromo Protests in Ambo, Oromo the Largest Nation of Africa. Human Rights violations and Genocide against the Oromo people in Ethiopia, Oromo University students and their national demands, Say no to the expansions of Addis Ababa, State of Oromia, Stop evicting Oromo people from Cities, The Colonizing Structure & The Development Problems of Oromia, Tyranny. Any system which crushes its brightest should not be considered a success….The Ethiopian government likes to trumpet its higher education system to its western aid backers as a crowning success of its development policy. As billions in foreign aid are spent annually on Ethiopia, the west must be more cognisant of the fact that this money helps reinforce a government which cuts down those who dare to speak out against it. Over the past 15 years, Ethiopia has become home to one of the world’s fastest-growing higher education systems. Increasing the number of graduates in the country is a key component of the government’s industrialisation strategy and part of its ambitious plan to become a middle-income country by 2025. Since the 1990s, when there were just two public universities, almost 30 new institutions have sprung up. On the face of it, this is good news for ordinary Ethiopians. But dig a little deeper and tales abound of students required to join one of the three government parties, with reports of restricted curricula, classroom spies and crackdowns on student protests commonplace at universities.The Ethiopian government likes to trumpet its higher education system to its western aid backers as a crowning success of its development policy. As billions in foreign aid are spent annually on Ethiopia, the west must be more cognisant of the fact that this money helps reinforce a government which cuts down those who dare to speak out against it. Nowhere has this been more evident than in Ambo in Oromia state. 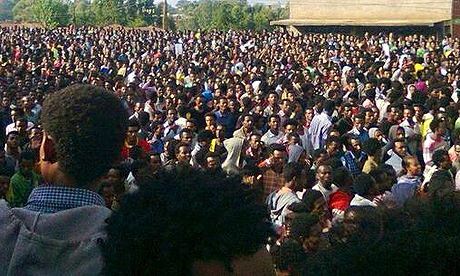 On 25 April, protests against government plans to bring parts the town under the administrative jurisdiction of the capital, Addis Ababa, began at Ambo University. By the following Tuesday, as protests spread to the town and other areas of Oromia, dozens of demonstrators had been killed in clashes with government forces, according to witnesses. As Ethiopia experiences rapid economic expansion, its government plans to grow the capital out rather than up, and this involves annexing parts of the surrounding Oromia state. An official communique from the government absolved it of all responsibility for the clashes, claiming that just eight people had been killed and alleging that the violence had been coordinated by a few rogue anti-peace forces. The government maintains that it is attempting to extend Addis Ababa’s services to Oromia through its expansion of the city limits. However, Oromia opposition figures tell a different story. On 2 May, the nationalist organisation the Oromo Liberation Front (OLF) issued a press release that condemned the “barbaric and egregious killing of innocent Oromo university students who have peacefully demanded the regime to halt the displacement of Oromo farmers from their ancestral land, and the inclusion of Oromo cities and surrounding localities under Finfinnee [Addis Ababa] administration under the pretext of development”. The Addis Ababa regime dismisses the OLA as a terrorist organisation. While news of the killing of unarmed protesters has caused great concern among many Ethiopians, there has been little coverage overseas. The government maintains strict control over the domestic media; indeed, it frequently ranks as one of the world’s chief jailers of journalists, and it is not easy to come by independent reporting of events in the country. Nevertheless, the government’s communique does run contrary to reports by the few international media that did cover the attacks in Ambo, which placed the blame firmly on government forces. The BBC reported that a witness in Ambo saw more than 20 bodies on the street, while Voice of America (VOA) reported that at least 17 protesters were killed by “elite security forces” on three campuses in Oromia. Local residents maintain that the figure [of those killed] was much higher. These reports, while difficult to corroborate, have been backed up by Human Rights Watch, which issued a statement saying that “security forces have responded [to the protests] by shooting at and beating peaceful protesters in Ambo, Nekemte, Jimma, and other towns with unconfirmed reports from witnesses of dozens of casualties”. One university lecturer said he had been “rescued from the live ammunition”, and that it was the “vampires – the so-called federal police” who fired on the crowds. The Ethiopian government likes to trumpet its higher education system to its western aid backers as a crowning success of its development policy. As billions in foreign aid are spent annually on Ethiopia, the west must be more cognisant of the fact that this money helps reinforce a government which cuts down those who dare to speak out against it. Inevitably, continued support for such an oppressive regime justifies its brutal silencing of dissent. Yes, the higher education system has grown exponentially over the past 15 years but the oppression and killing of innocent students cannot be considered an achievement. Any system which crushes its brightest should not be considered a success.